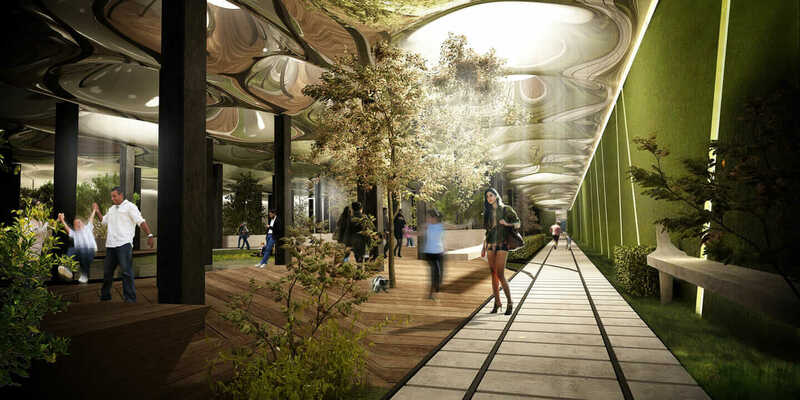 Rendering of the Lowline. Courtesy Kibum Park, RAAD. If you’re an urban spelunker, a New York City history buff, a techno-design nerd, or a futurist of either dystopian or utopian stripes, you’re probably pretty excited about architect James Ramsey’s plans for the Lowline—a subterranean park buried deep beneath the base of the Williamsburg Bridge in a repurposed, historic trolley-car turnaround. While other cities around the world have explored the potential of some forms of public space, there’s really no precedent for anything like the Lowline, anywhere in the world. Except maybe in science fiction. Historic trolley turn-around in current condition and before renewal into the Lowline. Courtesy RAAD. Cultivating this curiosity is a major challenge—how do you extend the public’s relationship with the aboveground streetscape to the ground beneath their feet? By peeling back a layer of the sidewalk to give a glimpse of what’s down below. Finding the space itself was a combination of misfortune (the great economic slowdown of 2008) and dumb luck. In the middle of the recession, Ramsey found himself with a lot of time on his hands, which he used to explore an interest in urban archaeology in the abandoned and forgotten corners of New York. It was during this stretch that former Metropolitan Transit Authority (MTA) engineer Jack Applebaum shared with Ramsey stories of 1970s New York, when the MTA was discovering subterranean tunnels beneath neighborhoods like Chinatown. 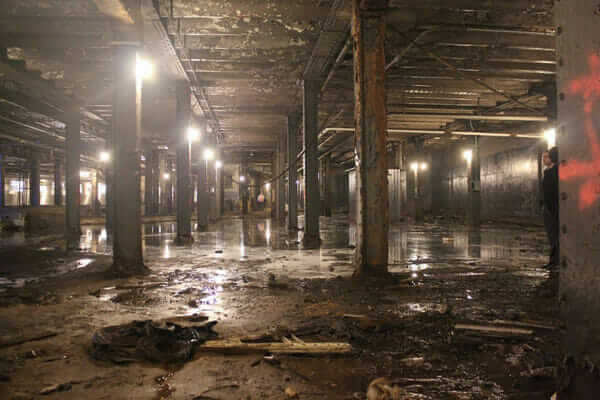 Applebaum introduced Ramsey to the space beneath the Williamsburg Bridge. A shadowy, subterranean, modern park illuminated by pools of natural light—the whole endeavor sounds impossible, like trying to combine the experience of being in a park in the day and at night at the same time. On top of that challenge, how does an architect remain authentic to a historical locale’s past while presenting a vision that’s fresh and forward-looking? 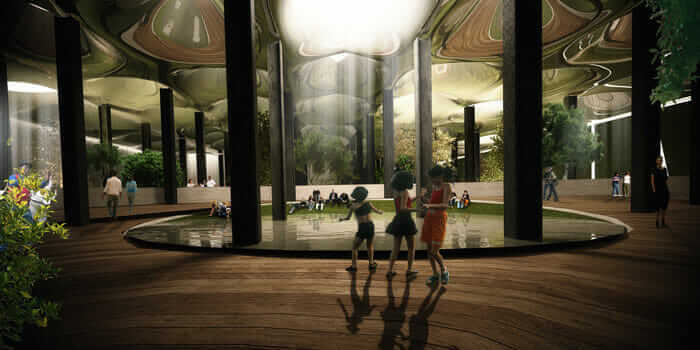 That is all well and good, but what will the experience of the Lowline really be like? Remote skylights will provide a simulation of the sky aboveground. Darker nooks will be interspersed with areas of brilliant natural sunlight and various types of foliage. 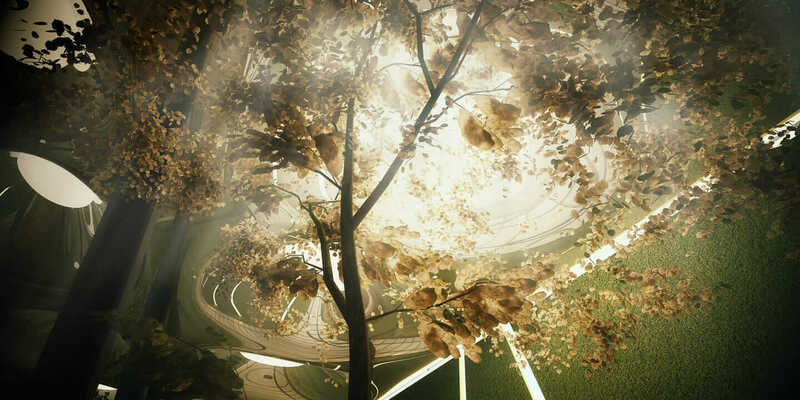 Exploring the Lowline will be, in Ramsey’s words, a sequence of experiences. “The nature of the space is big enough that we can embrace a number of different things. Parts will feel very open, well lit, and flexible, like most parks. At the same time, there are areas where we can start to get a little bit more playful, shaping visitors’ experience—with thicker or denser plantings, or more sunlight, like a crazy underground jungle. 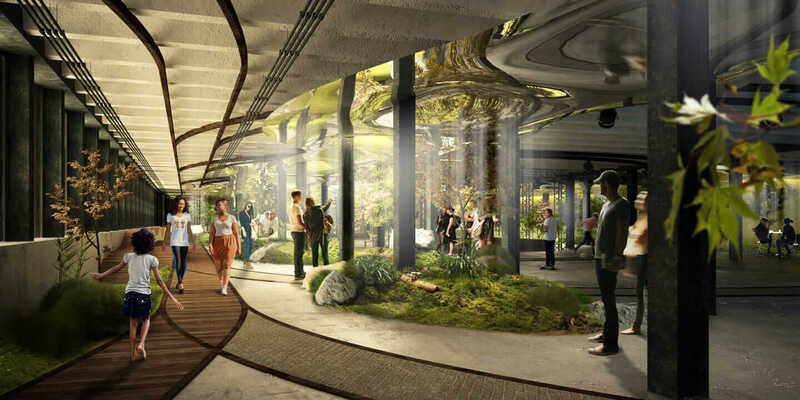 Rendering of the Lowline. Courtesy Kibum Park and RAAD.